I am officially addicted to running. 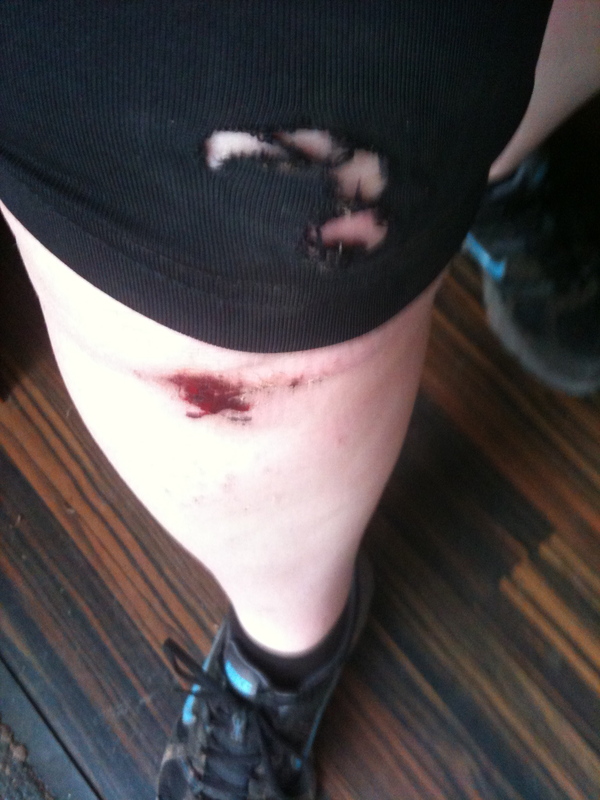 A third of a mile into my trail run I tripped, falling headlong onto the gravel and ripping a large hole into my leggings. After checking for damage and stopping my Garmin I stayed down for a while, just making sure everything was OK. My right knee and base of my hand were both badly scuffed and my knee was bleeding, but I wasn’t more hurt than that. I got up and walked around for a while, checking for pain and, apart from my knees and hand, I felt fine. And here’s where the addiction took over. Looking at my bloodied knees I pulled up my leggings so that they wouldn’t rub and carried on. That was my baptism. I decided to do 2 miles, rather than 3. Obviously taking it steadier after falling, I kept checking my body for further injury. As I ran on it became obvious that my right hip had taken a knock as well. My first mile came in at 10:07 despite my tumble, which was encouraging, but I decided to stick to my 2 miles anyway. Heading home is pretty much all uphill, but I managed that in 10:21, which is fine. 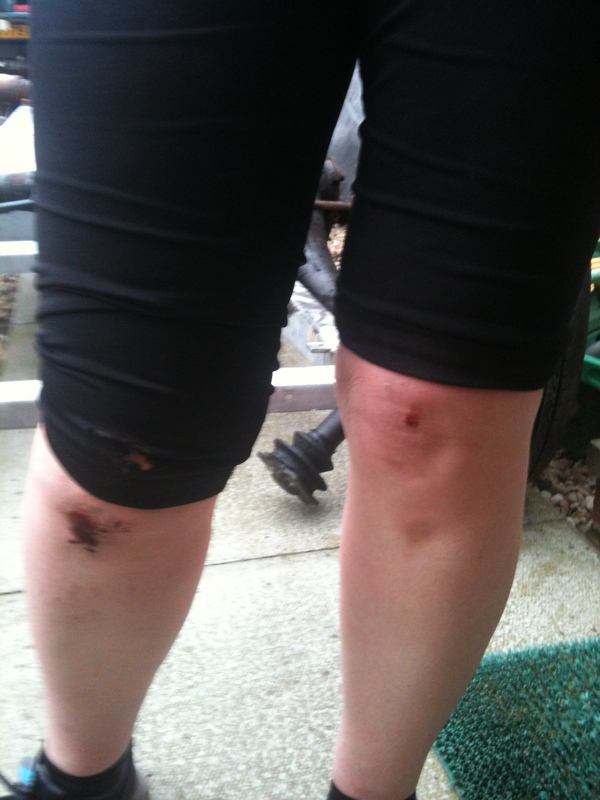 Overall, 2.01 miles in 20:32 and two bloodied knees! Summer has appeared in Scotland. It’s definitely summer; I distinctly remember that large yellow ball of light from last year. Actually, I jest. We did have a good patch of weather before Easter. The rain between then and now just washed it from our memories. This time though the heat has joined the sun, making running a sticky prospect. We went away for the weekend, only to Stranraer (about 80 miles from here) and arrived home on Monday to a shed load of jobs. I wrote a huge list and invited hubbie and son to choose from it and I picked the things they didn’t like. Inevitably my jobs didn’t involve machinery, apart from the washing machine to which I appear to have become harnessed over the years. I spent most of a hot afternoon weeding the garden. I wanted to do 8 miles, but decided to content myself with 4 because by the time it was cool enough I doubted I would have had enough light for more. I opted for my 5 mile route which with warm up and cool down walks would be just about right. Hubbie decided to join me…on his bike. I’ve relented and got an asthma inhaler to try and avoid that panicky feeling I get about half a mile in when my chest tightens up too much for me to properly breathe. It helped, for sure. My biggest problem on setting off was getting a GPS signal. Despite clear open skies Mr Garmin refused to link up and I ended up starting without him. I chose a steady, comfortable pace which, when he finally decided to appear, was between 9 and 9.5 minute/mile. It was still warm and I didn’t want to set off too fast. My route takes me up out of the village, up being the operative word here. The climb is a long one, about half a mile or so, and it zaps your quads and calves. Once I reached the top I walked for a wee while and swigged my drink. I’ve been buying Lucozade low cal sports drink, quite enjoying it. Once I’d caught my breath I carried on, this time downhill for a while. With my muscles recovering I hit the next hill with more ease, accelerating up it – much to the surprise of my husband who had to notch down through the gears in order to keep up! By mile 3 my IT band was causing trouble, pulling on my left knee so that every footfall was painful, but I ignored it and allowed myself to be distracted by the sun, the blue skies, the birds tweeting in the trees and the calves feeding greedily from their mothers. Oh, and my husband. When we headed down into the village I felt strong enough to sprint to the “finish” otherwise known as the village speed limit sign. We all have to dream. 3.99 miles at 10.34 pace. With the uncharted half mile added from the start I’d more than achieved my readjusted goal! And *cue fanfare* I had a negative split with my last mile being the fastest!! My quads are still aching…no kidding! Today is equally as hot so I’ve decided to not run until the cool of tomorrow morning when I’ll take Murphy down through the woods. I’m pleased to have my sensible head on. Bank Holiday weekends and what to do! We decided that staying at home and doing the same old, same old wasn’t really on and so my husband and I took a well earned break to a hotel just on the outskirts of a town south of Glasgow. We’ve stayed there before and knew that it had leisure suite which we could use as and when. In truth we were showing my car at a local car show and were making a long weekend of it. Why not! We arrived late on the Saturday, too late to get a swim or run in before dinner. Never mind, tomorrow would do. Tomorrow came and, right enough, I promised myself out loud (because out loud promises are heard by others and remembered and so have to be kept!) that I would go and try out the treadmill at the gym between coming back from the car show and having dinner. I wandered across with hubbie who was planning on a swim and suddenly remembered that I didn’t have a water bottle. Don’t worry, he said, gyms have water coolers. After signing in we went our separate ways, with me heading up to the gym. It was fairy quiet and no one else was running so I had my pick of the treadmills. I chose one away from the door and then tried to figure out the radio/TV socket for my earphones. I was walking by this time and realised that there was no radio, just the mind numbing muzak blaring out that everyone was trying to block out with their own iPods, and that the TVs were all set to different stations. The one in front of me had Songs of Praise on it, a religious programme for people who like watching other people go to church. By the time I’d started running Eamonn Holmes (a daytime TV presenter here) was bestowing the virtues of some seaside town and I was less than inspired. The treadmill, however, was wonderful! It was twice as wide as mine, with different displays to mine including pace and an electronic incline! How positively wonderful! I did a mile at just under 10 minute mile pace and realised quickly just how hot it was in the gym that appeared to have no ventilation or fans or anything. Perhaps, I wondered, this was why the rest weren’t running! I stopped to look for the elusive water cooler. It wasn’t in the gym. It wasn’t outside either. I went into the locker room and took a swig from the fountain. That would have to do. By the time I got back to my treadmill my first mile information had disappeared. This wasn’t going to do. I’d also put on a pair of shorts which were proving to be too short and my legs had started to rub together. I’d planned to do 6 miles, but 6 miles with no water bottle, chaffed thighs and Eamonn Holmes was a killer. I decided that I would run a fast two miles and call it quits. After getting changed I went to find my husband in the pool, only to find that he’d already left! I did 10 lengths of the 20m pool and came out. We arrived home yesterday afternoon and, after completing chores, I made up my mind to run my 6 miles. I did it on my treadmill, in my cabin at the end of the garden, with my last Matrix film on the TV and wearing my long shorts! I ran the first 3 miles in 28 minutes, which was pleasing enough and then carried on until I reached 6 miles. I did it in 59:50. I had been annoyed with myself for not keeping up with my weekly long runs and felt that I might start losing form if I kept running short distances, but doing a 10k in under 60 minutes was good for my body and my mind. I’m a little sore today, not much – just quads and hips – but feel quite pleased with myself! If I push, I know I can do it. I just need to promise out loud.